For the past six months I have been delivering a workshop for Sage partners on developing business strategy in a small business. There is nothing like teaching a subject over a sustained period of time to help you clarify your thoughts. In my last session in Herndon, VA, I believe I have stumbled across the Mother of All Strategy Questions – MOASQ. Most strategy sessions begin with the following premise – How much revenue do we need to make (in the time period for the plan) and how are we going to achieve it? The MOASQ shifts this – How much value are we going to create for our customers (in the period) and how are we going to do that? Premise A: The primary purpose of business management is to reduce uncertainty about the future – making outcomes more predicable by reducing risk. Premise B: Profits in business come from taking risks. I can’t help but wonder if this means that management, in the long run, kills profit. Help me understand how A is in alignment with B? For a long time I have been an admirer of Peter Block. His works Flawless Consulting, The Answer to How is Yes! and Community have long been on my recommended reading list. How do you do it? What is the refusal I have been postponing? How long will it take? What is the commitment I am willing to make? How much does it cost? What is the price I am willing to pay? How do you get those people to change? What is my contribution to the problem? How do you measure it? What is the crossroads at which I find myself? How have others done it successfully? What do we want to create together? Block’s general thesis is that while the How-based questions are important and need to be answered, the problem is that when they are asked and answered too early in the consulting process they tend to be a defensive mechanism against change and, therefore, they stifle creativity and innovation. 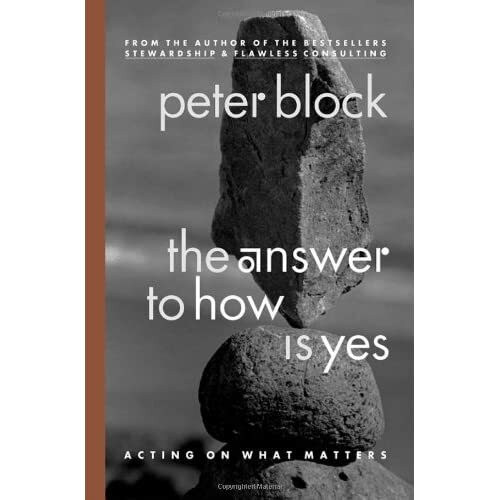 According to Peter Block a great consultant is one who is able to shift the dialogue to the What-based questions first and later return, if needed, to the How-based. With all of this, I agree. However, after having spent about seven years teaching these as is, I am ready (and perhaps bold enough) to recommend a couple of changes to the What-based questions. First, in place of “What is the price I am willing to pay?” I suggest the following: “What is the value of it to me?” After much thought, I believe this is the better question because it focuses on the primary idea of perceived value. As we know price is derived from perceived value, so looking at price is incorrect because it presupposes value. Second, in place of “What is the crossroads at which I find myself?” I suggest, “What is the judgment I need to make?” Unlike the first, I believe I am still completely in alignment with Block on this idea and my change is more in semantics. However, I like this question better because a) it is easier to understand and b) it is in alignment with my mantra much written about on this blog that all measurements are judgments in disguise. If you find this post confusing, might I suggest that you read The Answer to How… It is truly one of the best books on the subject of consulting ever written. One of the key devices I use as a consultant is something I call the “Help me understand” question. I use this when there is an apparent contradiction between two statements or behaviors of a person. The structure is this: Help me understand how A (one behavior or statement) is in alignment with B (the other behavior or statement)? For example: Help me understand how letting one of your best people get away from your organization is in alignment with your company’s stated goal of attracting and retaining great people? Sometimes this leads me to some very good insight and a much deeper understanding of the issues. Very often, I am convinced that A and B are, in fact, in alignment and that what was lacking was my deeper understanding. Other times however, the person I am working with is unable to reconcile the dissonance and adjusts their behavior or statement accordingly. Still other times I receive no feedback from the question, especially if I pose it in email. I can only assume that they make no adjustment and go on living a contradiction.